Last night I finished the first complete draft of the literature review chapter of my thesis. It’s 10,455 words long, and according to my versioning system it’s the 20th draft file. The first draft file is dated 26 August 2014. Anyway, early on I was dreading the thought of the anomalous excercise of writing the lit review. And when I started, I kept getting hung up on it. So many times I’d start doing work on it, then flounder so completely that work on the whole thesis would stagnate. This is my excuse for the chapter taking almost three years to complete. Three to four years is the regular timeframe for a full-time PhD in Australia, and while I’ve been part-time since early 2015 this chapter has still been an excruciatingly long endeavour. When something is repeatedly difficult, it becomes difficult to even pick up your work on it, let alone to get it finished. Something changed this year, though. Or started to change last year. 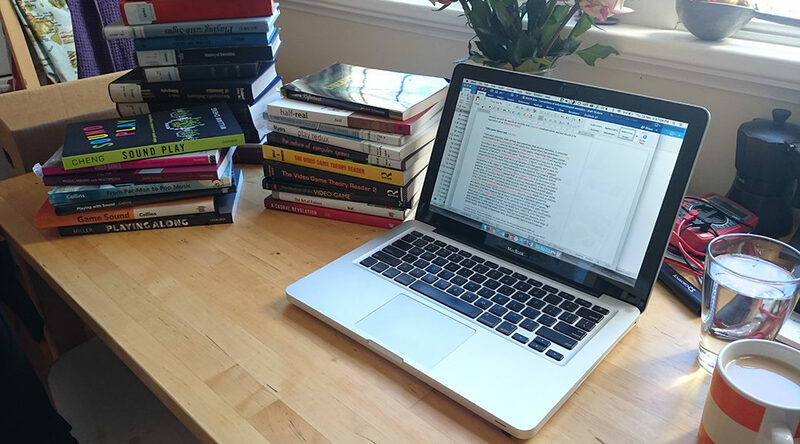 I took some time off work mid-2016 so that I could get deeper into the study mindset for a while, and wrote 20,000 words in a month. So, I did it again late-2016 and it didn’t work quite so well (not sure why). I tried it again over Easter and got sick twice in two weeks, the frustration of which seems to have extended my fervour for thesis work beyond the typical pattern (finally!). But something that did happen in these attempts was that for some bizarre reason I was kind of having fun. * There is an art to collecting, collating, and presenting information concisely. It requires a certain amount of creativity to determine what to include, how to include it, and how to relate it to everything else that’s included. Ludomusicological semiotics draws on a lot of fields — semiotics, musicology and game studies at the very least. The process of diving into each of these fields, threshing the salient points from the gritty details, weaving them into a coherent representation within 2,000 words or so, then dashing on to do the same thing for another entire body of work, is kind of a rush when it’s done at the pace of the final stages of a PhD. But I think I also just enjoyed seeing a snapshot of the full context of my work. In a young field, it’s easy to feel as though you need to justify your choice of study before you can even discuss it. Reviewing the literature gave me a perspective on my work that relates it not only to the ludomusicological literature of the last decade and a half, but to the literature of several well-established fields that go back much further. The most encouraging part of that is to see that my work is not an outlandish endeavour; similar things have been done before, in similar ways and for similar reasons. But, said work is not finished yet. There’s still a fair bit to do before my submission date (early August), and I’ve no doubt it will not be fun. Bloggings may well be as sparse as they have been lately. But hey, the end is now certainly in sight, and there’s one less seemingly insurmountable hurdle in the way. *This statement is possibly the nerdiest thing I’ve ever written.